This garden, on the outskirts of Bloemfontein, spans a valley between picturesque dolerite koppies. 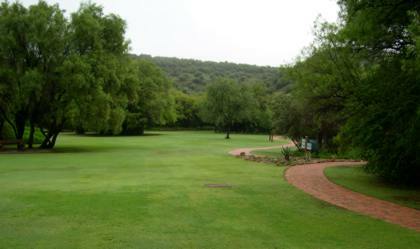 The natural vegetation comprises tall grassland and woodland, dominated by magnificent wild olive and karee trees. The harmony of the Garden has been achieved by retaining and highlighting the best elements of the natural landscape. The Garden covers 70 hectares, and is home to about 400 species of plants, mainly from the Free State, Northern Cape and Lesotho. 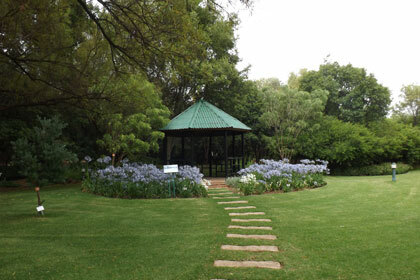 It also includes a collection of decorative and hardy trees indigenous to the area. Lion’s ear or wild dagga (Leonotis leonurus), red-hot pokers (Kniphofia) and the dwarf coral tree (Erythrina zeyheri) provide touches of colour against a restful woodland backdrop. A series of vistas lead one through the Garden to the wooded koppies, up on to the rocky outcrops, which overlook the Garden, and back down to the dam, the bird hide and the lawns. From November to March, most of the plants in the Garden are in full leaf and from March to June the colourful autumn shades of yellow and red dominate. The natural areas of the Garden are a haven for wildlife, including 144 bird species, 54 reptile species and about 32 mammal species. Visit SANBI’s plant information website for more on plants in our Garden.